One week into 2018, the ladies have already officially taken over our airwaves. The Plug returns with NFL injury analyst Stephania Bell to chop it up about the status of key players heading into this second week of playoff action around the league. Bell also gives insight into the complexities of her job and how her background in physical therapy directly affects her career. The squad then chops it up with Miss Quadruple-Double herself — Grambling’s own Shakyla Hill. The star guard talks about realizing the accomplishment was in reach and what she told her teammates in the moment. Her reaction to praise from LeBron James is priceless too. And you’ll never believe the role her mom played in making the historic quad-double happen. From there, Chiney, Kayla, Tes and myself wax poetic on a variety of topics, including Serena’s pink slip at the Australian Open, LaVar Ball’s recent comments about Lakers head coach Luke Walton, what the first round of NBA All-Star Game votes mean and, yes, O.J. Simpson’s Las Vegas tailgate experience. You should know the deal by now, but tell a friend to tell a friend to subscribe to The Plug on the ESPN app! Pull up on us next week! Previously: The Plug, ‘Happy New Year’ (Episode 4): with special guest co-host Mike Golic Jr.
9:24 PMThe Golden State Warriors hosted two special guests at Tuesday’s practice: entrepreneur Dr. Dre and his longtime friend and business partner Jimmy Iovine. Director of player programs Jonnie West set up the visit as part of the Warriors’ annual business of basketball meeting. 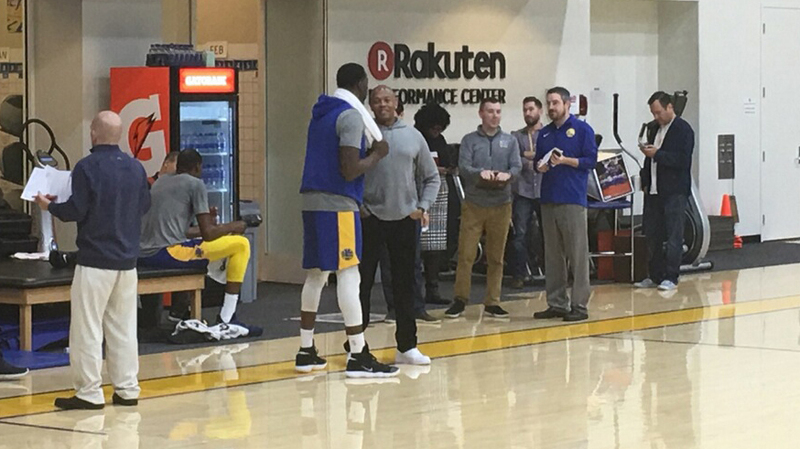 Dr. Dre and Draymond Green chat at Warriors practice Tuesday. Dr. Dre and Iovine are the founders of Beats Electronics, which they sold to Apple for $3 billion in 2014. “I’m a big Dr. Dre fan, so we got a pretty good deal today,” Warriors coach Steve Kerr said. “You saw these guys … Jimmy. We have our business of basketball meeting, which is an annual meeting. Usually it’s talk about the salary cap and stuff, so this is a little more interesting. 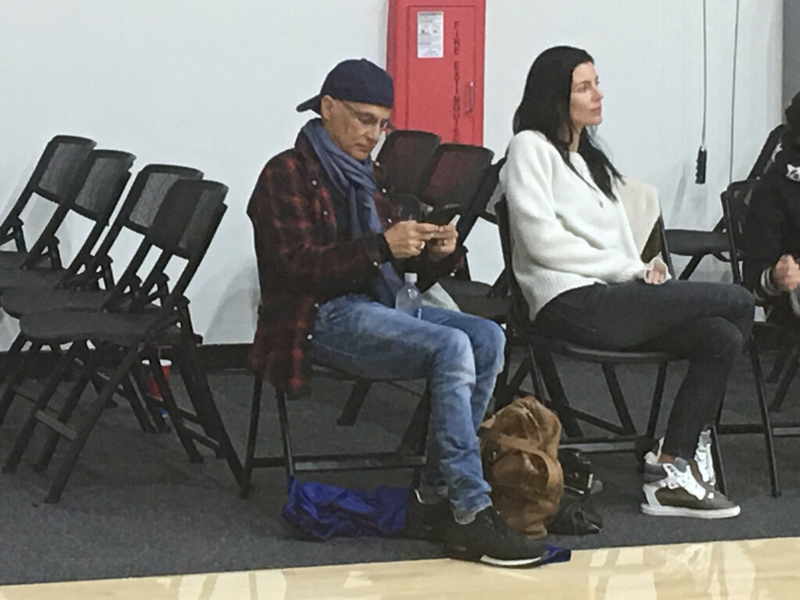 Jimmy Iovine (left) at Warriors practice. The players were surprised when Dr. Dre and Iovine showed up at practice. “When they walked in, I was tripping,” forward Kevin Durant said. Forward Draymond Green was eager to learn from Dr. Dre and Iovine. 4:13 PMFaced with a 13-0 halftime deficit, Alabama coach Nick Saban made the decision to switch from sophomore quarterback Jalen Hurts to true freshman signal-caller Tua Tagovailoa in the College Football Playoff National Championship on Monday night. Tagovailoa had never been brought into a game with the Crimson Tide losing, but in the battle of freshman quarterbacks, Tagovailoa outshone the Bulldogs’ Jake Fromm in front of what might as well have been a home game for Georgia playing at Mercedes-Benz Stadium in Atlanta. Tagovailoa orchestrated a comeback that saw Alabama score 26 points in the second half and overtime to win, 26-23. At least Georgia wasn’t the first team from the state to blow a cushy lead in its championship game (I’m talking about you, Atlanta Falcons). In one half of work, the Hawaii native went 14-of-24 for 166 yards with three touchdowns, including the game-winning 41-yarder, and one interception to help give Alabama its fifth national championship under Saban. When someone comes on the scene like that, well, it’s time to get to know them. Here are six facts about Tagovailoa and what his performance means in historical context. In 2015, a Samoan was 56 times more likely to play in the NFL than an American non-Samoan. For the most part, Samoans have been given positions along the defensive and offensive lines, linebacker, safety and occasionally running back. Quarterback has been an elusive position for the group. With Tagovailoa leading the Crimson Tide’s second-half comeback against SEC foe Georgia, he became the first Samoan quarterback to win the national championship. With three more years of eligibility and offensive MVP performance, the floodgates may open. Tagovailoa is by no means the first quarterback to represent the Pacific Island community, though. Washington State’s Jack “The Throwin’ Samoan” Thompson was in the discussion for the Heisman Trophy in 1978, was the highest-drafted Samoan (Cincinnati Bengals, third overall, 1979) and at the time only the fifth Samoan-born player to make it to the NFL. Tennessee Titans signal-caller Marcus Mariota took over the distinction of highest-drafted Samoan in 2015 (second overall). Mariota had the best opportunity to become the first Samoan quarterback to win a national title, but his Oregon Ducks lost to Ohio State in the first CFP championship game. Mariota was the first Hawaiian-born player to win the Heisman. Former Washington Huskies quarterback Marques Tuiasosopo, who in 1999 became the first player to pass for 300 yards and run for 200 in a game, had the next best opportunity. Tuiasosopo led the fourth-ranked Huskies to a 34-24 victory over Drew Brees and Purdue in the 2001 Rose Bowl and was named the MVP of the game. Tagovailoa is the nephew of Fano Tagovailoa, who in a 2002 ESPN.com article on Samoan football culture was regarded as “the best quarterback we’ve seen in Samoa,” according to a local coach. Fano was the backup quarterback for the undefeated Utah team that beat Pittsburgh in the 2004 Fiesta Bowl. And Tua’s brother, Taulia, the nation’s No. 8 dual-threat quarterback in the 2019 class, has already received an offer from Alabama. Their parents pumped the breaks on Taulia Tagovailoa committing in July 2016, but his brother’s success has probably dumped a whole bucket of gasoline on an already hot fire. Per ESPN’s Stats & Information, DeVonta Smith, who hauled in the game-winning touchdown, was a Georgia commit for a stretch during high school, while Tagovailoa received an offer from Alabama after they lost the commitment of Fromm. Funny how those things work out. From the short clip that Alabama offensive line coach Brent Key tweeted out, Tagovailoa has a pretty amazing singing voice. In a 2016 interview with SB Nation, Tagovailoa explained that Alabama’s biggest selling point for him was how intertwined religion was with the top-notch program. On a side note: An Alabama fan questioned Tagovailoa’s ability to adapt … because the fan thought someone from Hawaii couldn’t speak English. 🤔 I’m going to let you read this one for yourself. Hawaii has been the 50th state in the United States for almost 60 years. This was the first time Tagovailoa was inserted into a game in which Alabama wasn’t leading by double digits all season. Tagovailoa played in Crimson Tide blowouts. He finished the regular season completing 35 of 53 passes for 470 yards with eight touchdowns and one interception. The last time he saw the field was a month and a half ago, when he went 7-of-11 for 85 yards and three scores in the Crimson Tide’s win over Mercer on Nov. 18. Tagovailoa joined Ohio State’s Cardale Jones as the second quarterback in four years to lead their teams to a CFP national title victory without starting a game during the regular season. After securing his second Celebration Bowl championship last month, Broadway is reportedly hanging up his clipboard. An 11 a.m. news conference to announce his retirement is set for Tuesday. Broadway is walking away in Undefeated fashion, having finished last season 12-0 to give the Aggies their second black college national title in three seasons. Broadway, 62, coached the Aggies to a 59-22 record and retires as the only coach to win a black college football national championship at three different schools, including North Carolina Central and Grambling State. N.C. A&T was the only unbeaten team in the FCS this season. Always a straight shooter, Broadway has been candid, sharing his thoughts with The Undefeated on player activism as well as the extra responsibility black coaches have as father figures at historically black colleges. 9:20 AMJACKSONVILLE, Florida — Buffalo Bills guard Richie Incognito, suspended previously for his role in a bullying scandal, has been accused of making racial slurs during the team’s loss to the Jacksonville Jaguars on Sunday. Incognito wears No. 64. Ngakoue did not respond to a message seeking comment, but he spoke to reporters here Monday. He stopped short of saying Incognito used the N-word. Attempts to contact Incognito’s agent, David Dunn, were unsuccessful. In 2013, the Miami Dolphins suspended Incognito for the final eight games of the season after it was determined he was a central figure in the bullying of former NFL offensive lineman Jonathan Martin. Ngakoue used the hashtag #Iaintjonathanmartin! Incognito, 34, has revived his career with Buffalo after sitting out the 2014 season. In each of his three seasons since signing with the Bills in 2015, the 13-year veteran has been selected for the Pro Bowl. In only his second season, Ngakoue, 22, has emerged as one of the NFL’s best edge rushers. He led the league with six forced fumbles and tied for eighth with 12 sacks. Ngakoue’s father is from Cameroon. “I’ve been playing this game since I was a little kid. You hear all types of stuff,” Ngakoue said. “Stuff’s not going to bother you, but somebody says something about your ethnicity, that’s really kind of taking it a little bit too far.